October, 1938 to September, 1939 - Vishnive is still part of an independent Poland. September, 1939 to June 22nd ,1941 - Vishnive is included in the area captured by the Soviet Union as a result of its infamous agreement with Nazi Germany concerning the division of Poland. June 22nd, 1941, When Vishnive falls into Nazi hands, until the annihilation of the Jewish community on August 30th, 1942. To my dear aunt, Shalom! I read your letter. I am at home now, on winter break from school. We, thank God, are healthy. Uncle Leibl is healthy and working. Grandmother, as you know, is bedridden. Nothing new in your home. Also, nothing new in Vishnive. It is the middle of winter. Snow is falling, but our youth have begun organizing. Graduates of the school formed a group called "Graduate Organization". They meet every Friday evening at the school. There are lectures in Hebrew, and the teachers are participating. They talk about news from Eretz Israel, such as about "Chanita"(a new settlement). They sing and dance and hope to make "Aliyah". That is how we are spending the long winter nights, here in the "Exile", hoping for a more glorious future. My life at the Gymnasia (senior high school) is similar to your life in Eretz Israel. When we are in the Gymnasia speaking Hebrew, we forget about being in the "Exile" and imagine that we are in Eretz Israel. Regards to all the Vishniveans in Eretz Israel, to my friend Shimon Persky, to Zvi Abramson, to all the relatives, to Henech and his family, to Chaim and his family, to Aharon Zvi and his family, to Chaia Rivka, to Mordechai. Regards from Grandmother, from Rivka, from Leibl, from Uncle Yosef, from Aunt Mari, from all the family, from Father, from Mother, from Chaimke. …There is an offer to reopen the store, but we are worried about the heavy taxes. In addition, the international situation is unstable. No one knows what will happen next. We would not mind sending him to a "Yeshiva", but he refuses. He considers it to be below his status. He would not mind taking the Agricultural Courses in Lodmir. But Teibl does not agree since he would have to work there continuously for two years without returning home. How could she be separated from him for such a long period? …Now for some general news. The "Beitar" in Vishnive is rejuvinated, and even some former members of "Hashomer" have joined it. "Hashomer" is also on the move, and many new members have joined. "Hashomer" went for a one-week summer camp at Shlekovshtziene. At this time you can hardly find anyone who is politically unnaffiliated. Chaim and Avraham Binyamin are still unaffiliated, but only God knows how long they will be able to hold out. This political affiliation competition is so bad that it looks as if a plague, heaven forbid, is spreading. Even at school, from 3rd grade on, almost every child belongs to one of the two big parties, "Beitar" or "Hashomer". The competition and propoganda are so fierce that very soon they will begin to draft as members babies who just graduated from breast-feeding…. Chaimke says that all should listen to Chaia-Dvoshke. That is why if he has to choose a party, he will choose "Hashomer" even though all of his friends are in "Beitar". In the meantime, he enjoys his status as unaffiliated since everybody is trying to tempt him to join their party. For us, the teachers, we will have the responsibility next year of separating the two sides and trying to make them compromise. Other nations have "100 brains in 100 heads". By us it is one head and one hundred brains. Every little detail is a cause for major conflict. The hatred is so great that when "Hashomer" members were ready to go to their summer camp, they found that "Beitar" members had stolen their food and notebooks. This led to actual fist fights between the two camps. Suddenly in September, 1939 war broke out. Nobody wanted to believe that this would happen, but the Nazis were marching into Poland. The mood in the shtetl became very tense. On the second day of the war one could already see in town the arrival of the first refugees from Warsaw and Lodz. The refugees told about the German atrocities against Jews everywhere. There were rumors that the Germans were approaching us. The shtetl Jewish population was very scared. Then we heard about the agreement between the Soviets and Nazis, about the division of Poland. To our relief, Vishnive was to be included in the Soviet side. We knew that this would mean the death of the Zionist movement and the end of "Aliyah". However we knew that our lives were spared. No wonder that when the first Russian tanks showed up, the whole population welcomed them with flowers and with a large joyous demonstration. A stage was erected in the middle of the market place. The representative of the Jews - Yaacov-Hirsh Elishkevich - and the representative of the Gentiles gave enthusiastic speeches welcoming the Russians. They finished with a declaration: Long live the Soviet Union! And so, overnight, we became a part of the USSR. The Soviets forbade all Zionist activities. They shut off the Jewish Community Board and merged its authorities with the general civil administration. They closed the Hebrew School, as such, and created a substitute Public Yiddish School. They did not allow teaching in regular Yiddish, but only in Moskover Yiddish. Hebrew was forbidden. The teachers were also forced to stop teaching Hebrew culture and Zionism. This effectively cut the ideological foundation upon which this school had been built. In addition, the authorities established a Public Russian School for the whole population (Jewish and Gentile). This school was very good and well equipped. The Yiddish School was no match for the Russian School. 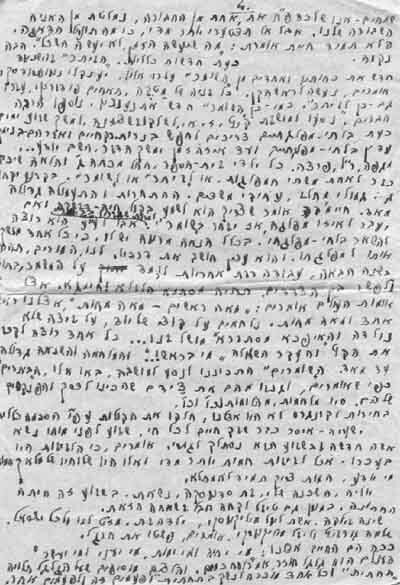 In a letter from that time, Yaacov-Hirsh wrote that he was the principal of the Yiddish School and was teaching in Moskover Yiddish. His letter was also written in Moskover Yiddish. In normal Yiddish expressions that came from Hebrew were written as they would be in Hebrew. But in Moskover Yiddish no Hebrew was allowed. These expressions would be written as Yiddish expressions. For example: the expression "Im Irtze Hashem" (with God's will) had to be written as "Yim Yirtze Hashaym". Only Hebrew letters were used. In another example, "Shabbat" had to be written instead as "Shabbos". In that letter, Yaacov-Hirsh also mentioned that Teibl was a homemaker and that the kids were in school. He was also very worried about the "Vulcano" around Eretz Israel. He meant that they were worried because Rommel (the German General) and his tanks were already in Bengazi (Libya). We received your postcard. We are glad to hear about your health. We are healthy and satisfied with our lives. I'm finishing my third year of Senior High School in the Russian School here in Vishnive. Studies in the Soviet school are free of charge. Anybody can study whatever he wishes and can become the most educated person. Comrade Lenin said: Study, study, and study again. This is the message from the Soviet youth. Be healthy and strong, from your nephew who is wishing you good life, A.B. Elishkevich. Regards from Everybody. Dear Aunt and Uncle, How are you? We are healthy. I study in 5th Grade (elementary school) in the Public Yiddish School in Vihnive. I study very well. Regards to all, from your nephew, Chaim Elishkevich. We received your postcard. I can write to you that all of us are healthy. Father is working as the principal of the Public Yiddish School in Vishnive. I am already in my third year of Senior High School in the Russian School. Chaim is in 5th Grade (elementary school) in the Public Yiddish School. Otherwise nothing is new with us. We are living and very satisfied with our lives under the leadership of Comrade Stalin*. We are thanking him daily for freeing us from the ugly capitalistic Polish rule. Regards from Father, Mother and Chaim, Grandmother, Leibl, Rivka, Gitke, Uncle Yosef, Grandfather, the aunts and their children. Regards to all the Vishniveans. From me, your nephew, Avraham-Binyamin Elishkevich. * Note: All letters from the Soviet period contained at least one Thank You sentence to Comrade Stalin.